Inside, the high priest began asking Jesus about his followers and what he had been teaching them. Jesus replied, "Everyone knows what I teach. I have preached regularly in the synagogues and the Temple, where the people gather. I have not spoken in secret. Why are you asking me this question? Ask those who heard me. They know what I said." Jesus taught openly. He preached to the masses in the countryside. He spoke openly in the Temple courts when he was in Jerusalem. He did not found a secret society built on deception or private meetings. In contrast, Jesus was illegally tried at night away from the people. Jesus, however, is the light. He taught and healed in the open, available for people to accept or reject. 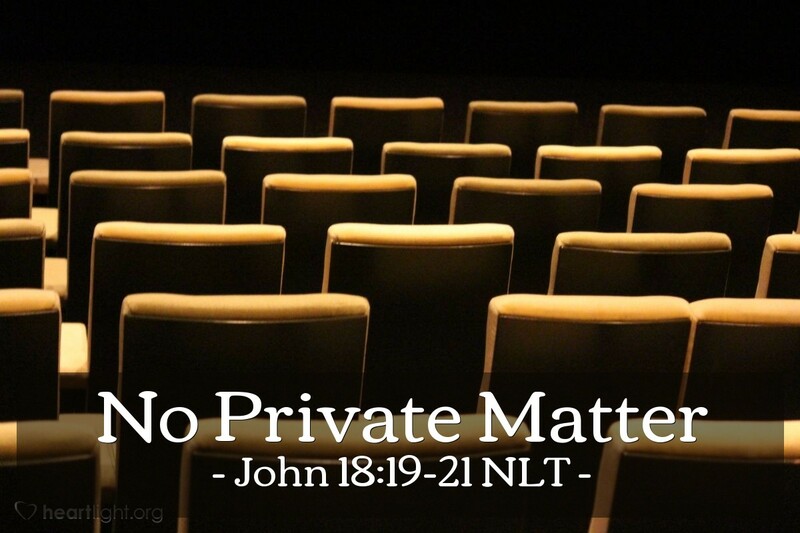 In much the same way, the Christian life is not meant to be hidden or kept tucked away. While our goal is never to be obnoxious or pushy about our faith, we also must realize that our Christian life is intended to be demonstrated openly before others so they can accept or reject it based on its integrity, character, and good deeds. O LORD God, please help the light of Jesus shine through me. May my life be one that brings you glory and may my attitude show that every good thing I have comes from you. In Jesus' name, I pray. Amen.